Detailed review of Dr. Ohhira's Probiotics. See how this probiotic supplement compares against all the others! At 3 out of 5 stars, I think Dr. Ohhira’s Probiotics is an above average, daily supplement. This is a very natural probiotic that goes the extra mile to steer clear of harmful chemicals and additives. You take 1 capsule, twice a day on an empty stomach. The capsules are small and very easy to get down. They remind me of little black jellybeans. The probiotics are fermented for 3 years and are supplemented with prebiotics, micro-nutrients, organic acids, and enzymes to promote healthy digestion, pH levels, and bacteria levels (you normally don’t get these additions in your average probiotic supplements). These capsules are 100% vegetarian and come in convenient blister packs that require no refrigeration. I wish I could rate this probiotic higher but it’s just too expensive! It costs almost $2.50 to take these capsules every day, which is over 5x the average cost of a daily probiotic. This product also contains fermented soy and is NOT safe for kids. If you can get past the crazy price tag, I think this probiotic offers a lot of great qualities and may be able to do some good for your belly on a daily basis. This product has 900 million cells in 12 different probiotic strains. Of note, I really like the use of Streptococcus thermophilus in the strain profile. This strain is naturally found within the large intestine and has been researched to show possible benefits in nutrient absorption and immune response. S. thermophilusmay also help individuals with lactose intolerance because it creates lactase, an enzyme in the body that helps break down milk protein. Additional properties of this strain are supposed to help with decreasing diarrhea, supporting the body’s unique stomach flora, and easing symptoms of leaky gut syndrome. I also like the addition of Bifidobacterium longum to the probiotic lineup. B. longum is also naturally found in the body’s digestive tract and has been shown to promote the growth of healthy bacteria. This strain may also help boost the immune system and help the body fight off colds or respiratory infections. B. longum may also help prevent diarrhea while taking a round of antibiotics. Dr. Ohhira’s Probiotics contains fermented soy. Soybeans that have been in long-term fermentation are meant to be easier to digest, even for those who have soy allergies. Still, if you have severe soy allergies, please steer clear of this probiotic. On the positive side, this probiotic is non-dairy and free of gluten, egg, fish, crustacean shellfish, tree nuts, wheat, and peanuts. It’s also 100% vegetarian, non-GMO and chemical free. The other ingredients included are: Mountain spring water, safflower oil, beeswax, lecithin, capsule (tapioca processed from Manihot utilissima root, glycerin, carrageenan and caramel color). For 30 capsules, (a 2 week supply) it will cost you $36.25. This ends up being an extremely expensive $2.41 a day. This is one of the most expensive probiotics I’ve tried so far. I really did like the product but I’m not sure if it’s worth the high price. I did see some side effects while taking this probiotic. My stomach was upset for the first 2 or 3 days of taking the supplement, but nothing too crazy. I felt like the product was working, though, which was a good sign. The box warns against possible laxative effects, minor bloating or bouts of constipation. These side effects are supposedly meant to be the first signs of the probiotic beginning to detoxify your body. It warns that if this goes on longer than 10 days to consult a doctor. If you are already prone to these effects, be sure to ease into this one! Unfortunately, I was unable to find any sort of satisfaction guarantee on Dr. Ohhira’s Probiotics website. That’s too bad… I would’ve really liked to see a guarantee for this probiotic. 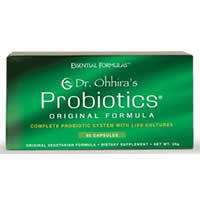 To buy Dr. Ohhira’s Probiotics, click here.